The Christian way of doing things is the opposite of what the world things is successful. We don’t use our elbows to get ahead. And we don’t sweet talk our way to the top. Instead, we are called to love others as we love ourselves. And love does not give us permission to selfishness. Instead, it urges us to become deep-spirited friends. We can leave coldness, selfishness, and hate at the foot of the cross. When we do this, God’s grace empowers us to live a life of love instead. We are called to love our brothers and sisters, neighbours, even our enemies. God wants the best for us and being friends, especially deep-spirited friends, is the best life can offer. Friends are gifts from God. So, if you do not have any deep-spirited friends, ask God to send you a new friend. Meanwhile, spend lots of time with the ultimate friend, Jesus. He will make you more loving, grace-filled, and ready for becoming deep-spirited friends when the time is right. Then you can keep on pushing each other to grow closer to God. And have the time of your life while doing it. Thank you for the gift of friendships. make us ready for being deep-spirited friends. 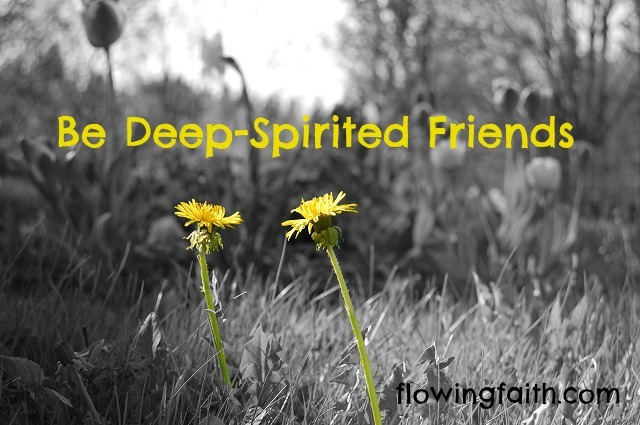 Q4U: Do you have deep-spirited friends? Do they help you to grow in grace? Be blessed, my fellow pilgrim, as you grace empowers you to live a life of love! 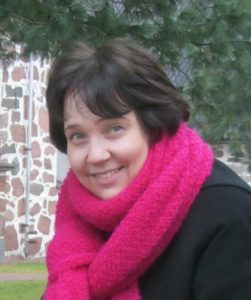 Image courtesy of Tim Pirfält, design by Mari-Anna Stålnacke. Linking up today with Dance with Jesus, Five-minute Friday.